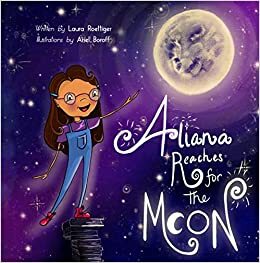 Written by debut author Laura Roettiger and illustrated by Ariel Boroff, Aliana Reaches for the Moon, will be released February 19, 2019 to coincide with the full moon. The story is about Aliana, a creative and curious little girl, who learns to harness the beauty of moonlight to make her little brother a delightfully personal birthday gift. Aliana has light-brown skin, long wavy dark hair, and big brown eyes framed by purple glasses. Her affluent family is Latinx and they live in a lovely home with many large windows framing the Rocky Mountains. The family life Roettiger and Boroff conjure is just as perfect as the family’s picturesque home. Every morning, the family gathers around a big table for breakfast, and the children spend their days horseback riding, hiking nature trails, and making messy experiments. Their parents do not mind the messes, and Aliana’s brother, Gustavo, looks up to his big sister. Even as she fills her days with love and learning, Aliana sets aside time to experiment with marble, quarts, vases, and moonlight to stage a fleeting but fantastic “magical birthday cake” on the evening of Gustavo’s birthday. This is a sweet edition to a growing collection of STEAM themed books featuring little girls putting their big brains to work. Hey, thank you for sharing this review. Please check your email. Looking forward to reading this one! Great review! Thank you! You don’t have too long to wait!